Cologne - The closest relegation dogfight in history and the neck-and-neck race for UEFA Europa League football take centre stage on the penultimate weekend of the 2014/15 Bundesliga campaign on Saturday (all 15:30 CEST/ 13:30 GMT kick-offs). After being bang in contention to qualify for the UEFA Champions League earlier in the year, Schalke may well have to win their last two games of the season just to keep the chasing pack at bay and secure one of three places in the Europa League. Both those fixtures come against sides currently fighting to stave off relegation to the second tier, starting with the visit of SC Paderborn. "The situation for us is clear: We have to win," affirmed Schalke head coach Roberto Di Matteo. "In our current position, only a win will do." Indeed, should the Royal Blues drop points and Borussia Dortmund and SV Werder Bremen pick up wins, the Gelsenkirchen club could fall out of Europa League contention altogether. By the same token, victory coupled with favourable results elsewhere would secure their place in Europe with room to spare. Precarious as it may be, it is a situation promoted Paderborn can only dream of. Andre Breitenreiter's side have performed admirably in recent weeks, yet find themselves in the bottom two by virtue of their inferior goal difference. The Bundesliga first-timers face 18th-placed VfB Stuttgart on the final day, by which point they could be anything from rock-bottom to 14th in the standings. 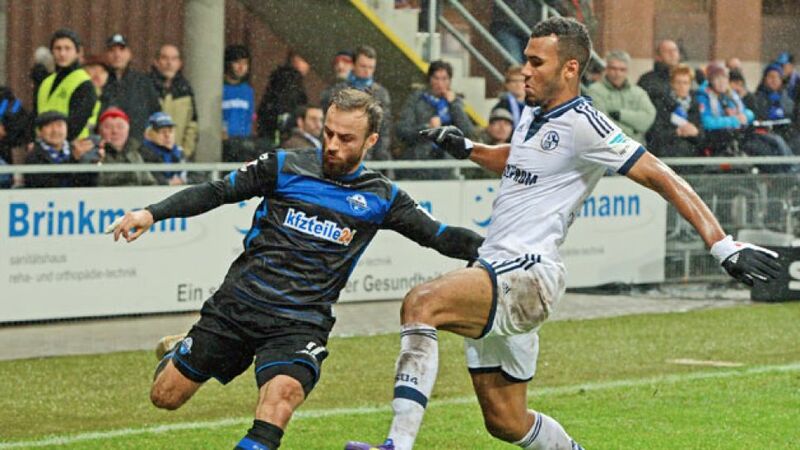 "It's a tense situation," admitted Paderborn captain Uwe Hünemeier. "We want to take something from the game against Schalke. That way we can't be relegated early. That takes the edge off somewhat. In the meantime you have to laugh about it [...] Schalke have got their problems, we've got ours." Amidst all the inevitable ifs, buts and maybes associated with the business end of any given season, fifth-in-the-table FC Augsburg represent something of an oasis of calm. The provincial Bavarian outfit have been ticking along in and around the top six since Matchday 11 and, having long done what they set out to do - avoid relegation - can now cap a superlative campaign with a place in the Europa League. "We're in a great position," explained Augsburg head coach Markus Weinzierl, safe in the knowledge that four points from the final two games would at least be enough for the Europa League qualifying rounds. "It's not about the door being slightly ajar. If we win, it doesn't matter what the other sides do. The games have to be played. We'd be well advised just to focus on ourselves." Weinzierl's door analogy also applies to relegation play-off incumbents Hannover 96, the only Bundesliga team without a win this calendar year. If the Reds can't break that unwanted cycle in Augsburg, the swinging object in question might be about to slam shut on Lower Saxony's capital club, who could finish the weekend as many as two points adrift of safety going into Matchday 34's home encounter with Freiburg. "We're preparing meticulously for the match against Augsburg," explained Hannover head coach Michael Frontzeck on the eve of his fourth game in charge of the club since replacing Tayfun Korkut last month. "The team are making a good impression and we want to come away with the points." Interestingly, the 96ers haven't lost any of their seven Bundesliga meetings with Saturday's hosts (W4, D3). Berlin's Olympiastadion is going to be the focal point of football fans the world over in the coming weeks, and Saturday's final Bundesliga game of the season to be staged there is likely to whet the appetite just nicely. With the DFB Cup final between Borussia Dortmund and Wolfsburg to follow on 30 May, and the UEFA Champions League final between Real Madrid CF and Juventus a week later, Berlin is the current capital of football and the city's resident Bundesliga club Hertha will be keen to ensure that top-level football will be staged there again from August by picking up the points they need for survival against Eintracht Frankfurt. "Let's beat Frankfurt and put a lid on it, for good," said Hertha coach Pal Dardai, whose side can expect to be safe with a win. Frankfurt have no such concerns, though, and they can just go out and enjoy the occasion on the green baize which is set to be trampled by some of the Bundesliga's and Europe's best in the coming weeks. One of them is Stefan Aigner, who dismisses suggestions he and his team-mates are already on their summer holidays in their minds. "That's rubbish," said the Frankfurt forward. "The stakes are still high - we can earn a higher league position, which is worth a lot of money for the club too." And that is without mentioning the momentum they can build going into the new season with a run of victories. "It's about time we won a few games in a row again," added a motivated Aigner. Two sides already planning for another year in Germany's top-flight, meanwhile, meet at the Coface Arena where 1. FSV Mainz 05 host promoted 1. FC Köln. Martin Schmidt has done a fine job at steadying the ship in the wake of Kasper Hjulmand's departure three months ago, even if the 05ers have lost their last two. "We want to show that we can perform better than we did in the last two games," he told journalists at his penultimate pre-match press conference of the season. "I want to see another typical Mainz home display. The players will be playing without any pressure, which normally makes for decent, interesting games." Köln, for their part, secured their Bundesliga status as recently as last Sunday thanks to a comfortable 2-0 home win over faltering FC Schalke 04. The fact the Billy Goats have done so without having spent a single weekend in the bottom three whilst boasting the best defensive record outside of the top four speaks volumes for a side who had spent the previous two campaigns in the second tier. "We want to maintain the buzz," Köln midfielder Kevin Vogt told club website fc-koeln.de. "There are still two games to go and we want to give it our all. Points are still there to be won, and our final standing in the table is yet to be decided."